That picture? That was my reality Thursday night. Sixth row, center, for one of the best concerts I’ve been to in a long time. I saw Maroon 5 back in July and didn’t have a great experience. When I was able to snag a seat so close for this show I had high hopes and expectations for a wonderful night and they did not disappoint. I was close, y’all. The picture doesn’t do it justice. Damned iPhone. I was closer than it looks like I was and I could see all of the boys’ faces very well, and it was heaven. I have been to a lot of concerts. I have seen musicians who looked like they wished they were somewhere else during the performance. On the flip side I’ve seen musicians who appeared to be having a good time entertaining the crowd. But I have never seen anyone who came close to enjoying himself onstage as much as Jesse Carmichael did last night. I’ve never seen someone standing on stage playing and being present in the moment like that. He just seemed so into the music and happy to be alive, right there with us. It was an absolute joy to watch and it touched my heart. He’s a brilliant musician and then to see him being so invested in the performance and taking such delight in it was very special. I wish I could spend some time talking to Jesse because I feel like he’s got a really positive outlook on the world and seems like a genuinely good human being. I would’ve been happy just to watch Jesse perform but….then there was Adam. Oh, Adam. No matter what was going on elsewhere around the stage, my eyes kept being dragged back to wherever HE was. The boy is compelling. He smiled a lot, which is unusual for him and probably part of why I kept staring. I got a whole different vibe off him than I did at the Paso Robles show. He seemed friendlier, more engaging, more relaxed and like he was having a good time. There was a girl in the general admission section with a sign that said “How” on it (one of their songs). They haven’t been performing it at all – but Adam sang a verse and a chorus just for her, while she bawled. He was simply lovely. And, God have mercy, those eyes. I was close enough to see them pretty well. He’s absolutely beautiful. You have to wonder when you see people on t.v. – do they really look like that in person? They may have twelve tons of makeup on, or be airbrushed in pictures. In Adam’s case, he looks in person just as he does on television – or possibly better. The only complaint I have is that the show was too short. I could happily have gone for another hour, at least! But was I did get was a thrill. You know how I know it was a good show? 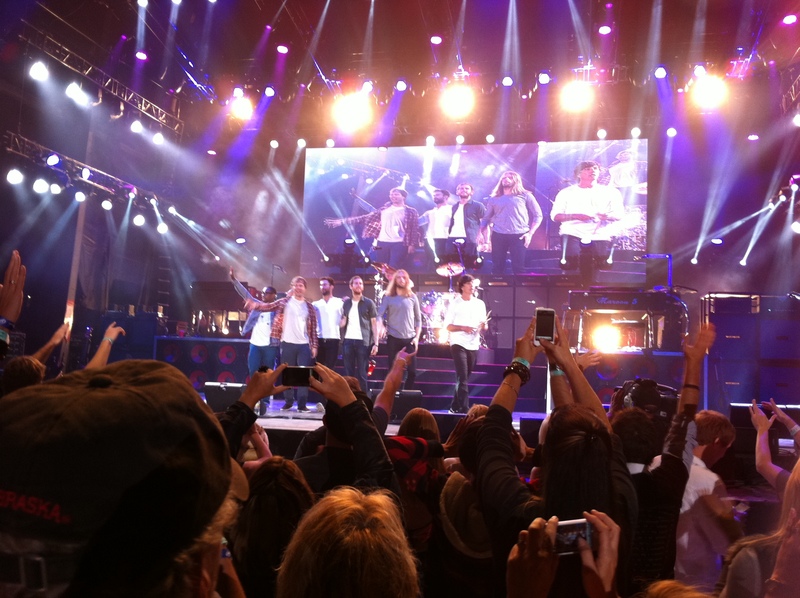 When the band left the stage for the final time I had that moment of, “No! Wait! Take me with you! Please!” I haven’t had that since I saw Paul McCartney. I’d have given a kidney last night if they would’ve just agreed to let me stow away in a cupboard in the tour bus. Tonight I felt jealous of the people in Dallas who were watching them perform. And I felt sad that the tour is almost over and that I don’t know when I’ll have a chance to see them again. Worth every penny. And then some.